The T-Mobile Arena in Las Vegas, Nevada was the host site for the biggest UFC PPV of 2018, featuring a main event between Khabib Nurmagomedov and Conor McGregor for the UFC Lightweight Title. The arena was starting to fill by the time of the first fight of the main card of the ppv, a strawweight woman’s bout between Michelle Waterson (15-6) and Felice Herrig (14-7). Waterson opened up with using her kicks more like jabs and was effective with her front leg side kick to the thigh. Herrig was able to land a solid straight right in the opening round, but Waterson was more effective with her strikes. Herrig was able to get Waterson’s back against the cage in the early moments of the second round, but Waterson was eventually able to break free and land a hard high kick to the head of Herrig before throwing her to the ground. Waterson was able to finish the second round with some strong ground and pound. Herrig was able to find some success in the third round with her dirty boxing and was able to defend one of Waterson’s takedown attempts and maintain control on top. But Waterson was able to land some hard elbows from the bottom and briefly threatened with an omoplata. The final scores were 30-26, 29-28, and 30-27 for Michelle Waterson. The next bout of the night was a heavyweight bout between Former M1 Heavyweight Champion Alexander Volkov (29-6) and Derrick Lewis (20-5) . Volkov was the much taller fighter and was controlling the first round with his reach and counter right hands. He was able to get side mount and transition to taking the back of Lewis, but Lewis was able to regain top position and land some short elbows as the round ended. Volkov was able to stun Lewis with a combination in the opening minutes of the second round and had the left eye of Lewis swollen. Lewis took several hard shots but was able to stay on his feet. Lewis took several hard right hands form Volkov in first half of the third round but showed he had a strong chin and took his best shots. Lewis looked like he was going towards a decision loss but he landed a devastating right cross followed by some concussive ground and pound that turned off the lights of Volkov. Derrick Lewis wins by shocking knockout at 4:49 of the third round. The next bout of the night was between Ovince Saint Preux (22-11) and Dominick Reyes (9-0) in the light heavyweight division. Reyes, a southpaw, exchanged body kicks with Saint Preux in the opening round and was able to stuff the takedown attempts of Saint Preux. Reyes was able to land some short elbows to the side of Saint Preux’s head on some of the takedown attempts, and had Ferguson is applying pressure. Lands a hard straight right. By the second round Reyes had landed six times the number of strikes that Saint Preux had landed, and had the forehead of Saint Preux badly bleeding. Saint Preux looked exhausted near the end of the second and Reyes had built a comfortable lead. Saint Preux needed a stoppage in the final round to pull out the victory and he did press the action, but Reyes was able to fight wisely and suddenly landed a stunning left cross to the chin of Saint Preux that sent him crashing to the mat as the round came to an end. Dominick Reyes wins by decision with scores of 30-27 on all three scorecards. The co-main event of the night was between Tony Ferguson (25-3) and Anthony Pettis (21-7) in the lightweight division. Ferguson looked like the significantly bigger man but was hobbled by leg kicks from Pettis early on. Ferguson and Pettis both tried spinning back fists in the opening round and were able to land hard shots, but Ferguson was landing the harder shots. Pettis was able to drop Ferguson early in the second round, who had blood pouring out of his mouth from the shots of Pettis. Ferguson was able to cut Pettis to and get back to his feet and recover, and continued to apply continuous pressure and pound on Pettis from cage side to cage side. Pettis had a cut by his hairline and the ringside doctor took a look at it but allowed the fight to continue. Pettis got tagged badly several times as the round came to an end. Tony Ferguson wins by TKO at the end of the second round due to a broken right hand on Anthony Pettis. The main event was between Khabib Nurmagomedov (26-0) and Conor McGregor (21-3) for the UFC Lightweight Title. McGregor, despite being the bigger draw, entered the Octagon first to a positive fan reaction and Khabib entered second to mainly boos and jeers. McGregor pressed forward in the opening round and was able to land an overhand right and some low leg kicks. Khabib went immediately for a takedown and McGregor was able to immediately stop it. Khabib completed the takedown and finished the round on top of McGregor but was not able to do much damage from there. McGregor got tagged with an unexpected vicious overhand right in the second round by Khabib that had McGregor mometarily hurt. Both were throwing hard, wild punches and Khabib goes in for a takedown and is able to finish it. Khabib lands some hard ground and pound through the remainder of the round and at one point threatens McGregor with a kimura but doesn’t finish it. McGregor had a much better third round and was able to tag Khabib with several combinations and stuffed his takedown attempts. McGregor appeared to gain some momentum this round and Khabib showed signs of tiring. Khabib appeared fired up at the end of the third round and was yelling at McGregor as he went back to his corner. Khabib opened up the fourth round by throwing a wild two punch combination but missed wildly, and McGregor was able to land with a two punch combination of his own. Khabib goes in for a takedown and completes it and transitions into a full mount. Khabib lands some heavy ground and pound before before taking McGregor’s back and sinking in a rear naked choke. McGregor is forced to tap and Khabib doesn’t immediately let go. As Khabib rises to his feet he appears to spit in the direction of McGregor and immediately begins yelling at the corner of McGregor. 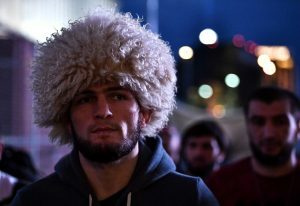 Khabib, who just had the biggest win of his career, then goes nuclear and jumps out of the octagon and goes after one of McGregor’s cornermen and starts a fight in the crowd. All hell breaks loose and one of Khabib’s teammates jumps in the ring and begins unloading on McGregor. It takes several minutes before officials are able to restore order. Khabib, still enraged, demands his belt but Dana White refuses to put it on him. Khabib is escorted out of the cage and into the back with a lengthy suspension almost certainly to follow. A career defining win for Khabib turns into one of the most shameful moments in MMA history.